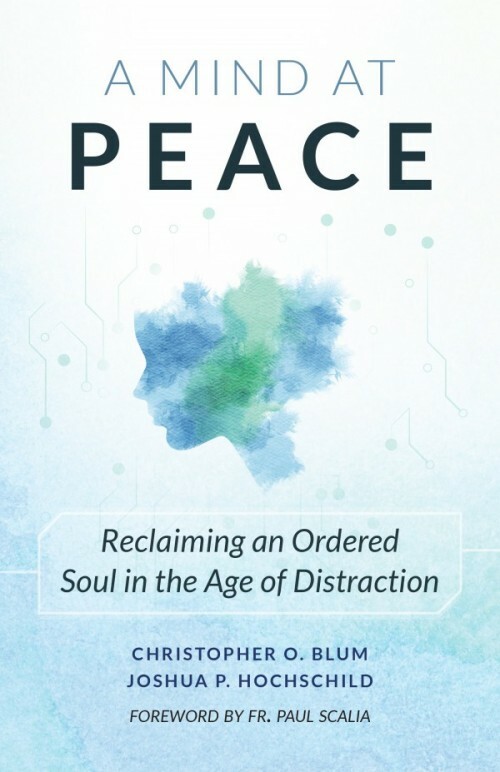 Christopher Blum and Joshua Hochschild have co-written the book A Mind at Peace: Reclaiming an Ordered Soul in the Age of Distraction. The digital age, ushered in by the scientific revolution, discombobulated by the Enlightenment dictum that “man is the measure of all things,” makes any child of this age an heir to confusion. Confusion is of course the enemy of peace as well as the enemy of order. The authors repeat the wisdom of St. Augustine who tells us that “peace is the tranquility of order.” The brilliant lights of technology increasingly obscure the intellectual and moral shadows engulfing our world. We are progressively distracted and increasingly numbing to the realities which have always flowed from the nature of man and our place in the cosmos. Without a recovery of a proper understanding of the created order and the nature of man in that order, we are destined to be confused, agitated and anything but at true peace. We are more susceptible than ever to that falsity of fallen men decried by the Hebrew prophet who abjured deceivers who proclaim “peace, peace, when there is no peace.’” There is little true peace in the world today. However, there are extravagant claims to peace made by the world which lies incessantly. Blum and Hochschild have penned the antidote to the agitated ravages of this age. They do not provide a pop-psychological balm of self-esteem building magic, but a plea to return to the philosophical anthropology in order that we might come to know ourselves, not as we wish to be, but as we actually are so that we might experience the harmony that follows a proper ordering of things. What makes this book so valuable is that all of its wisdom proceeds from an authentic understanding of the created order and particularly from the nature of the human person. Its instruction is informed by the Great Church Doctors, the great philosophers and other faithful souls. They combine to elucidate not only divine revelation as it relates to human action and our common destiny, but the best of unaided reason propounding the ultimate virtues as they correspond to our intellectual and moral formation. This order they clarify is the intellectual and moral order for which we have all been made as we discover our place in the cosmos. A Mind at Pace is broken down into three parts. The first is on living well, the second on sensing well and the third on thinking well. These three segments illuminate the three orders we must master if we are to attain to the peace for which we were intended; the moral order as it is lived out is the first; the order of reality in the created cosmos as it is intelligible to our senses and experience is the second; and the order of right thinking is elucidated by the third. Each of the three parts of the book has six chapters that expound six characteristic attributes on how to understand each particular aspect of that order. Each of the 18 chapters has a meditation and several reflection questions that help center the reader for contemplation on the deeper levels of what was read. After illustrating the importance of self-awareness and the fact that “the power to choose and to act is the key to achieving peace,” we are instructed rightly that “peace is a perfection of human agency.” We are alerted to the present dangers of technology and social media and the devastating effects of these increasing distractions on true peace. At the end of the short chapter, as of all the chapters, we encounter a short meditation. This one is called “Blessings on Those Who Choose God’s Way.” It is Psalm 1 which begins “blessed is the man who walks not in the counsel of the wicked.” Questions for reflection end the first chapter and one who slows down enough to truly contemplate what he has read will have much upon which to reflect. The rest of part one winds its way through beatific and eudemonian virtues required for peace such as purity of heart, steadfastness, poverty of spirit, reliability and nobility. Living well requires the right use of our faculties comprising our senses in the effort to subordinate the passions to the right use of reason. We have suffered a privation of grace by the Fall which darkens our intellect, weakens our will and inclines our appetites to evil. Relying on that reality, there has been a particular recent set of attacks on the right order of things since the advent of Ockham’s nominalism in the 14th century. The attack on universals and concomitant increasing distrust of human apprehension has led to increasingly radical skepticism. In the end, this was an attack on the first act of the mind, that of apprehension which precedes that of sensing well. Our five outer senses and four inner senses are cultivated and sharpened by the six topics in part two. The authors implore us to be resilient, attentive, watchful, creative and experienced. These aspects of our sensing well are the beginning of all learning if we come to see by apprehension what is really in front of us. If all learning begins in the senses, it must not end there. That image of God imprinted on our souls is the image of intelligence gifted solely to man on this mortal coil. After sensing well, we are called to think well about what we experience. As nominalism afflicted the first act of the mind, apprehension, the Enlightenment philosophers initiated a set of attacks on the second act of the mind, proper judgement. Perhaps most prominent of them all was Immanuel Kant (1724-1804) who drew us away from right judgement and down the path of subjectivism, rendering sound judgement about objective reality a relic of antiquity. Blum and Hochschild rightfully encourage a recovery of right judgement by the series of six vital topics. To be purposeful is to discover final causality. To be truthful is to adhere to the objective order of reality. To be reasonable is trust in that image of God imprinted on us all. To be decisive is to take a courageous stand for truth and order. To be wise is to see things as they are. To be Humble is the prerequisite of wisdom. There is no substitute for thinking well, but it must surely be preceded by sensing well. These three orders covered in the three parts of A Mind at Peace correlate as well to the tripartite human soul; the will, appetites and intellect. All three are intended to be understood as three aspects of the integrated composite whole of the human person. These truths are obscured by the artifacts of the Fall which make it difficult to navigate any human era, particularly the present. The authors zero in on the predominate fault of this age known as “the unnamed evil of our times” is the sin of acedia. The authors recognize and assert that acedia is not just “some kind of laziness, but truly a kind of discouragement, torpor, or despair, a sense of purposelessness and powerlessness.” Strange indeed are these times. Disorder and disharmony are proliferating aided and abetted by mass media, education and politics. It is difficult to know where to turn. In the middle of Tolkien’s masterwork, The Lord of the Rings, there is a conversation between the future king Aragorn and the Third Marshal of the Riddermark, Eomer, son of Eomund. Eomer called his days in Middle Earth “days of doubt” and we might say the same of today. He goes on to say “the world has grown strange…. How shall a man judge what to do in such times?” Aragorn answers, “As he ever has judged, good and ill have not changed since yesteryear; nor are they one thing among Elves and Dwarves and another among Men. It is man’s part to discern them, as much in the Golden Wood as in his own house.” Blum and Hochschild remind us as Aragorn would, that even though these are strange and confusing times, we are to judge as we always have. We must apprehend what is; discerning what is good, true and beautiful according the objective standard of truth by that natural law written on our hearts. The authors write an afterword concerning the “peace beyond.” In it, they summarize the intention of the book which is to survey the “range of the soul’s powers and virtues (of bodily appetites, and exterior and interior senses) in service of the higher (the properly intellectual)- not only because they are the higher, but because the modern condition poses particular challenges to the mind’s discipline and peace.” They want the reader to understand that mastering the proper order from our lower to higher faculties and putting those in the right order assumes the help of God’s grace. And although our efforts are required, there is the peace beyond that this book points towards, that peace which is pure gift from God and our part in attaining it is merely humble disposition to receive the gift. Peace is a gift that follows order. Let Blum and Hochschild instruct us in the ways of preparing to receive that gift by subordinating our lower faculties to our higher faculties and our higher faculties to the providence of God. Overall, A Mind at Peace is a worthy meditation sorely needed by this generation. We are in dire need of a recovery of the ability to live well which must be preceded by the proper apprehension of our capable human senses, followed by the right judgments in thinking well. All this in order that we might come to make decisions for our lives that lead to the “tranquility of order.” This order is not asserted for the sake of the individual alone, but as a preparation for the community life of the domestic church which is the source of the common good. This book is valuable as an accessible primer to the great Church Doctors, the faithful and wise philosophers whose voices echo with truth across the ages about how we ought to order our lives to encounter true peace.